…I was going to say wearing this thing is kind of like wearing those plastic fangs the last time you were Count Dracula for Halloween. …I was going to say that Snap-On Smile looks more like something you would find on the White Trash Repairs website instead of a nationally broadcast TV commercial. 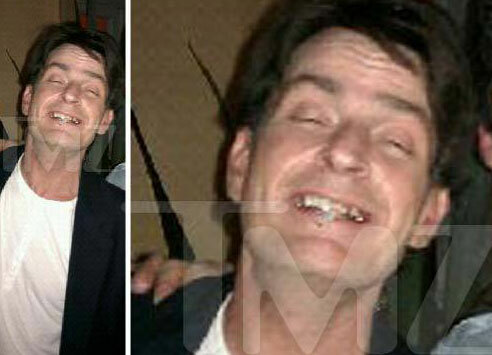 If you’ve seen Charlie Sheen on 2 and a Half Men, his teeth do not look those of a homeless crack-addict. So if Charlie Sheen does not actually use Snap-On Smile, then he uses some dental product very much like it. Let this be a lesson to us all: Why bother to brush, floss and give up the Mountain Dew when you can simply cover your corroded teeth with white plastic…just like the multimillionaire Hollywood actors do! SnapOn Smile : the right product in the wrong color ! Montréal (Québec) Canada, February 22, 2012 – When I received my first SnapOn from Denmat, the California based Company in spring 2011, the A3 yellowish color (Vita common shade) requested was rather a B1 ultra bright white color SnapOn which mismatched my age (over 60 years old). I then tried it and chewed in such a way that the upper part of the SnapOn literally exploded in pieces in my mouth. Summer after, I received another upper part from the SnapOn Company, as a replacement for the broken one, but this time, it came in the right A3 color originally requested. So the new yellow upper part didn’t match the white lower part I had, because of SnapOn Company mistake in the first place. The two different colors lower and upper parts SnapOn were then returned to SnapOn Company for replacement as requested by a representative who expressed compassion and understanding.